Chop, oil, fry, stir, sprinkle with salt. Where’s the fun in that? Trick question. There is no fun. But one rainy day found me standing in front of the vinegar section in the supermarket, wondering if a new type of vinegar was the missing piece in my life. Balsamic vinegar was too Italian and wouldn’t fit in with the Asian sauce clique in my kitchen. White vinegar was an old friend that had overstayed its welcome. Beer vinegar had the word “beer” in it and I wasn’t sure I could make it through the checkout line without being humiliated by the classic “You’re not over 21” phrase. So I tried red wine vinegar, because at least if I were humiliated, red wine would sound classier than beer. At first, the soy sauce alpha male bristled at the introduction of the new kid. The white vinegar got a little jealous. The cooking wine was disgusted by its red-colored second cousin, once removed. But that’s okay, because the red wine vinegar made unlikely friends with two little vegetables. The rest was edible history. Notes: You could experiment with other types of vinegar, but it just doesn’t give the same wine-ish, sweet and sour taste. Alternatively, you can use real red wine plus white vinegar. Still not the same though. Taste & Texture: The red wine vinegar is complex. It’s like Luxembourg, but it borders sweet, sour, and red wine-y instead of Germany, France, and Belgium. 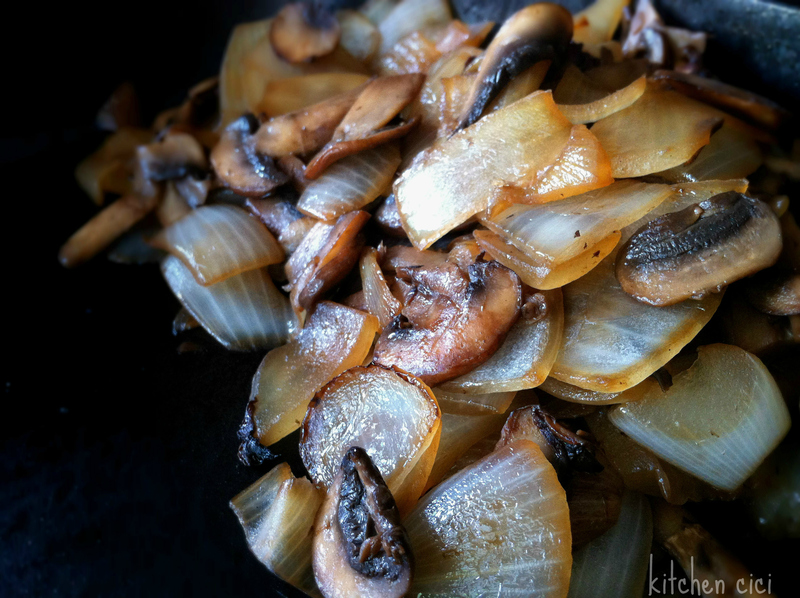 It’s quite a lovely combination, and the crisp onion and mushrooms provide a solid neutral base for that flavor. 1. Chop up everything nice. Today was a good camera day. 2. Cook onions until somewhat wilted. Add a dash of sugar while you’re at it. This was on another day, when I did a really good job of cutting up the onions into strips. 4. Then add everything else. Vinegar, sugar, soy sauce, etc. 5. Cook until the onions are translucent and everything is nicely wilted. I didn’t cook it until the onions were translucent, though, because I just wanted to eat. I was actually planning to take these pictures on a previous day, when my cooking skills and camera skills were a little more impressive. However, on that day, something unfortunate happened. My mother dumped half a head of cabbage into my lovely red wine mushroom & onion stir-fry. And I proceeded to eat it anyway. That, my friends, is how things go in this kitchen. You could always omit the mushrooms, but I can’t vouch for the results! Haha. Holy moly that’s a lot of vinegars. Thanks for visiting me too! By the way can I just say that your profile picture is the cutest thing ever. What a great side for my grilled steak tomorrow! Ab. So. Lute. Lee. It complements steak so well! Yum, this looks like such a great and simple side dish! Schmanks 🙂 So easy too. I actually just bought red wine vinegar for the first time and i can’t wait to try this! For me, balsamic vinegar is starting to loose it’s welcome. This sounds yummy….I will have to try it, as I do love red wine vinegar! Thank you so much for stopping by to check out my blog. All the best to you at University….may you make many new friends with kitchens! I’ve never heard of plum vinegar before! I’ll keep my eyes out next time. Couscous, you say? Interesting. Thanks for the follow! 😀 I’m slightly addicted to mushrooms, so plan to give your recipe a whirl sometime soon. On another note, I totally agree with you about the whole study thing – I left Oxford last year because I discovered I was more passionate about cooking. If I could find me an apartment with just a bedroom and BIG kitchen (fully equipped with all the gadgets of course), my life would be complete. Sending lots of foodie love your way. That is an intriguing take on mushrooms, I’ll definitely try that some time!